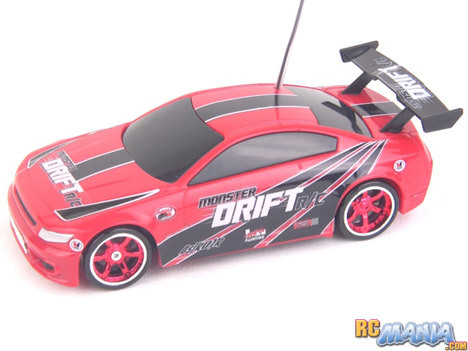 The Fast Lane RC Monster Drift cars by Maisto Tech have been on the market for quite awhile, and I thought I had missed the boat on doing a review. However, so many readers like you wrote in asking me to test out this car, I decided to go for it after all. This is a 1/24th scale car and it's available in a handful of body style & color combinations. The standout feature is all-wheel-drive, which is unheard of for such a low-cost RC. It's not even locked 4WD -- it's better. All four wheels are driven forward when you're on the throttle, but when you turn, let off the throttle, or tap reverse, one or both of the front wheels can actually free-wheel and turn slightly faster. This is an advanced feature traditionally on large, expensive hobby-grade racing cars to provide extra steering traction. I look forward to seeing if this really works as intended. The car uses four AAA batteries and the small, kid-friendly controller uses one 9V cell. There controls are strictly on/off -- there's no digital proportional steering or throttle. Also included in the package is a cool little scale traffic cone, which you can use to practice tight hairpin turns and controlled donuts. Cars as small as the Fast Lane RC Monster Drift car are very sensitive to the type of surface you drive them on, since the texture of the ground can be really huge & bumpy relative to the size of the tiny slick tires. On a high-grip surface, the car can't drift very far, but it can do 180 degree turns and open hairpins with the rear end swinging out wide. On a smooth surface it's a completely different story. Drifts are fully controllable and you can countersteer for wide drifts or tap reverse from full speed to act like a handbrake and whip around tight turns. It takes practice to get good at controlling drifts and linking different ones together, but the car itself does not hold you back. How well you do depends solely on how well you develop your own skill. Check out the driving footage in the video below. The Fast Lane RC Monster Drift cars by Maisto Tech are amazing. They perform as advertised, or better, and the price is right. This is the way the whole toy-grade RC industry should work. You make a promise, you keep it, and you sell quality products for an affordable price. I highly recommend these cars to anyone looking for some true indoor drifting fun. Note: This review was not sponsored or sanctioned in any way by Fast Lane RC, Maisto, or any vendor. I bought this item at full price at the store and evaluated it without bias based on its actual performance.